If you are looking for concrete restoration in the Nashville, Tennessee area you need not look any further. Our company specializes in floor restoration, overlays, coatings and superior heavy duty performance floors. Our coatings are ideally suited for industrial, institutional and commercial use. We can install self levelling cementitious urethane floor resurfacer, with or without a slip resistant quartz finish. 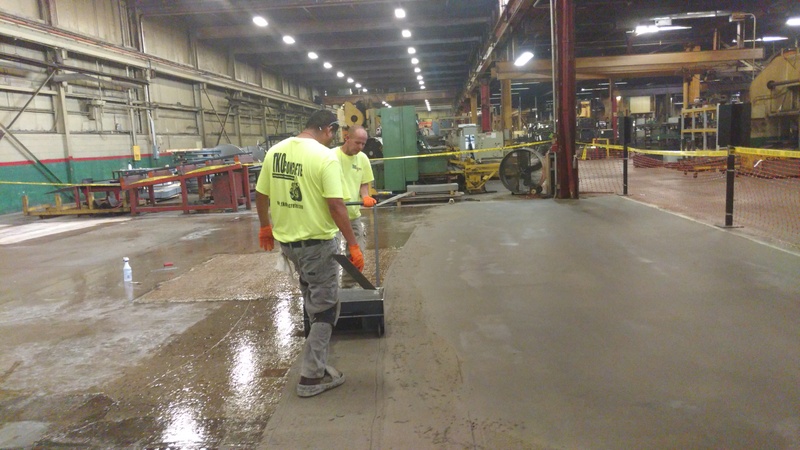 We regularly restore floors in beverage, food, and chemical processing plants. Other industrial applications include aircraft hangers, automotive dealers, and transportation terminals. Cracked or broken surfaces can be unseemly and tearing it up and laying down new cement is an expensive and time consuming process. Businesses, factories, plants, production facilities understandably, can’t shut don’t production to fix off-level or broken concrete and they shouldn’t have to. We can repair your damaged areas while you work or during shut down. Unarco manucturing plant. Concrete Restoration with epoxy mortar. Polymer-modified overlays can be applied in layers as thin as a credit card or up to several inches thick without delamination or failure. They adhere well to existing floors and resist damage from salt, chemicals, UV exposure, freeze-thaw conditions, and abrasion. Urethane cement floors are ideal for areas that require heavy duty performance. Applications usually include factory floors, food & beverage, breweries, chemcial processing and pharmeceutical plants. These systems protect new concrete against delamination and spalling. Also known as cementitious urerthane floors. This material is far superior to epoxy flooring systems in food and beverage applications because it withstands thermal shock. Whereas epoxy flooring systems will delaminate with hot and cold wash downs. Just like epoxy you can also add aisle striping and solid colored coatings to give your floor a clean and highly durable floor. We are based in Nashville, Tennessee and conveniently located to service the southeastern United Stated. If you have a concrete restoration need please call 615-414-3727 today.